Your roof is a big investment. Help protect it right from the start against water damage in the attic, which can cause mold growth and rotting deck boards. Deck Defense® High Performance Synthetic Roof Underlayment features a durable construction that works with your shingles to help shield your home from moisture infiltration. 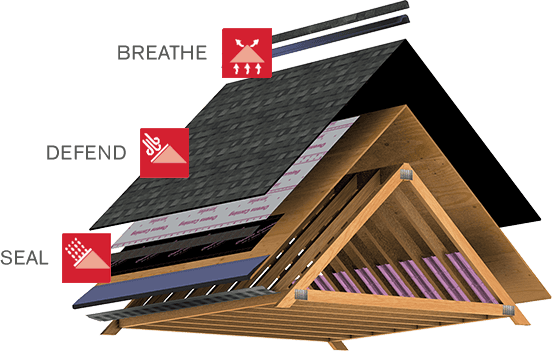 Deck Defense® High Performance Synthetic Roof Underlayment is part of the Owens Corning® Total Protection Roofing System®^. Coverage (with 3-in. overlap) 937 sq. ft.
* Special application required for extended exposure. See installation instructions. ** See actual warranty for complete details, limitations and requirements. Underlayment is tested as part of a roof assembly that includes wood decking, underlayment and asphalt roof shingles. Applies for all areas that recognize Miami-Dade Product Control Section.